By giving players the gritty, tube-driven front end and a lighter, more portable 450-watt solid-state power section, the SVT-3 PRO continues the proud, toneful, SVT tradition. Brainworx expertly modeled the amp’s hybrid circuit as well as its 9-band graphic EQ and 5-position midrange selector for a dizzying array of sonic possibilities. 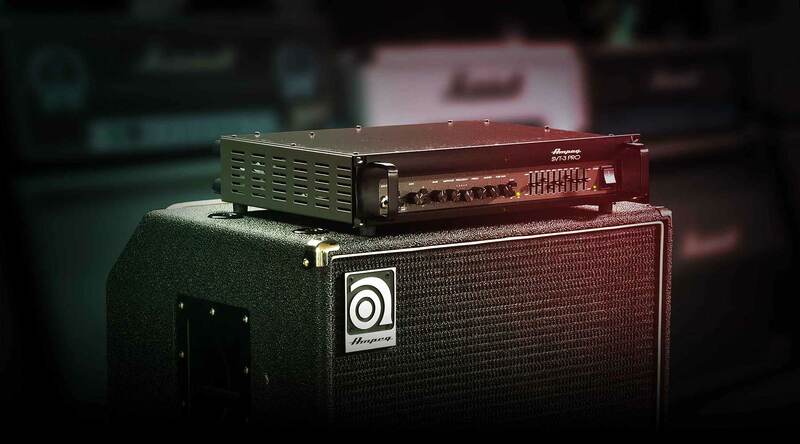 The Ampeg SVT-3 PRO plug-in features tools that greatly add to its versatility when tracking bass. The FX Rack features an onboard noise gate, host-syncable Power Soak, and pre/post switchable EQ filter controls, allowing you to put the finishing touches — before or after mixdown. But it’s the SVT-3 PRO plug-in’s 26 Recording Chain presets that give you the ultimate in flexibility. Captured through Brainworx’s ultra-rare Neve VXS72 console, these presets let you audition your sounds through a variety of vintage mics, cabinets, and outboard gear. Harnessing UA’s groundbreaking Unison technology, the Ampeg SVT-3 PRO plug-in gives you the impedance, gain staging, and circuit behaviors that have contributed to making this iconic amp one of the most recorded bass amps in history.